Perry had his first play-date Saturday. We went over to our friends the Parton's house to hang out with Kim, Coleman and baby Barrett (while both husbands worked). Barrett was born about 2 and a half months ahead of Perry. 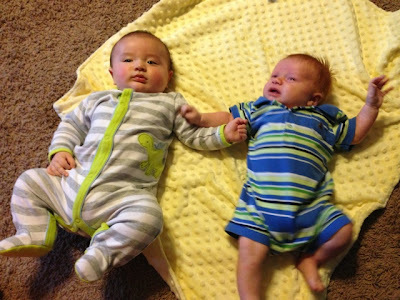 I know they are going to be good friends as they grow up together. A couple months looks like a huge difference now...but it won't be long where it doesn't make any difference at all.